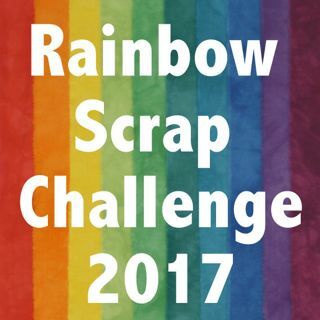 I have been working my way though my scraps by following along with the Rainbow Scrap Challenge 2013. 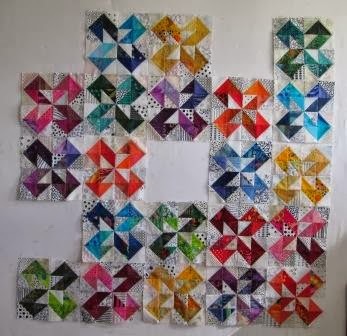 I was not planning on doing every colour for this block but just the primaries and secondary colours. So we have done those six colours now. I am a little behind and need more Red blocks and maybe just one or two other blocks to fill in all the wholes. I have added this post to Judy's Design Wall Monday. The Block is Jack in the box. I found it in Bonnie Hunter's Addicted to scraps . I just needed some triangles to get this block done, it is 8" square. 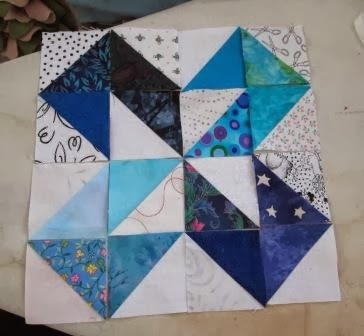 I am thinking it will be a great baby quilt for some special kid. Last week I was at a special evening sale at Quilter's Dream and entered the draw. I won one of the prizes sponsored by Pfaff. Eight great rayon threads. We will have to see how I use them. My kids think I am lucky because I win these draws but they have no idea how many of these draws and raffle tickets I buy. Maybe I am a little lucky. I love these blocks! Bright colors just speak to me. Might have to add this one to my "to-do" list. I love your blocks... thanks for including the link! They are perfect for RSC13. those Jack in the Blocks are great! Love your quilt so far! Just a few holes to fill in. I do like it for a baby quilt... all that color and the pattern is just right, too. Thanks for showing it. Love your Jack in the Box blocks! And thanks for sharing your source! Congrats on winning the tread! I like the jack on a box blocks. The backgrounds really make the blocks--a bit of movement that is just perfect. This is going to be very pretty.